On Monday both kids were happy to have the exact same lunch. People — this never happens! Or it happens so rarely that it’s OK for me to say it never happens. 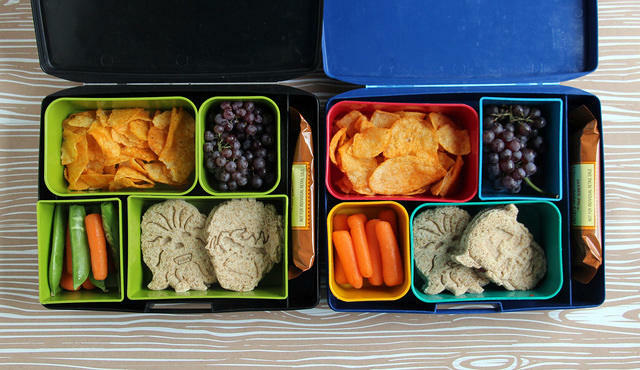 I used the Laptop Lunches bento boxes for both kids and they each had BBQ potato chips (a special first day of camp treat), champagne grapes, carrot sticks, sugar snap peas (Augie only), and they each had sunbutter and jelly sandwiches — Chewbacca and Hulk for Augie, Chewy and Captain America for Wyatt. I also tucked a granola bar into the side of each box for their morning snacks. And then it happened again! Identical lunches two days in a row! Both boys had leftover pasta in thermal jars for the main part of their lunch and they each had a side car with nectarine chunks, carrots and snap peas. 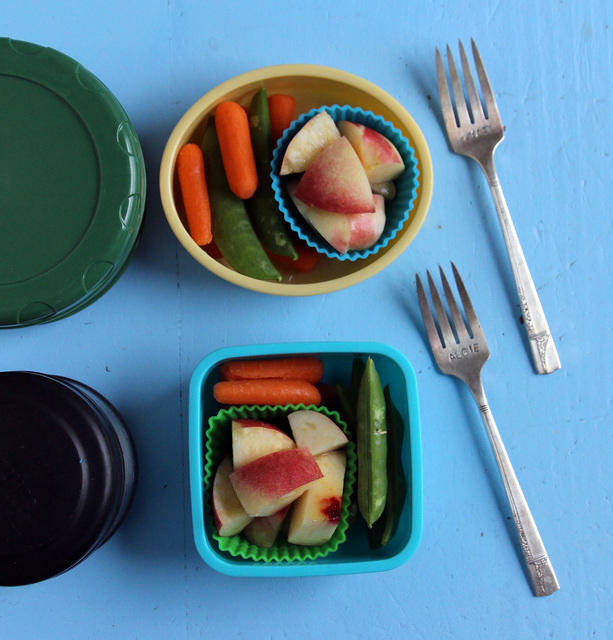 I separated the fruit from the veggies by putting it in round and square silicone baking cups and I threw in the boys’ personalized forks from BellaJackson Studios for the pasta and nectarines. The thermal jars are from LunchBots (top) and Thermos (bottom). Guess what! The kids had the same lunches again! Apparently they were so similar that I only photographed Augie’s bento, but his is basically the same as Wyatt’s so I’m sure you’ll survive without the photo. They had raspberries, blackberries and strawberries from the farmers’ market, teddy grahams, ham roll-ups, and veggies with dip. Augie had the carrots, snap peas and red pepper dip you see here, along with a mini dipper full of hummus. Wyatt had radishes and pepper strips with ranch dressing. Both lunches were packed in a Laptop Lunches box. Thursday we shook up the lunches with slightly different configurations. 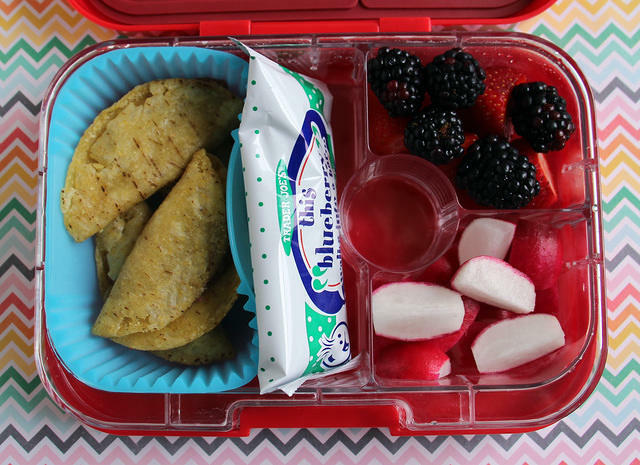 I packed Augie’s lunch in the PlanetBox and he had strawberries, blackberries, a blueberry cereal bar, hummus, carrots and mini tacos. I packed Wyatt’s lunch in the Yumbox Panino and he also had mini tacos, a blueberry bar, blackberries, and strawberries. I swapped in radishes in place of the carrots Augie had. Friday morning the kids were bickering like crazy and I kept having to break up fights and holler at them to get ready for camp so things were hecka hectic. I was pressed for time so I made these crazy simple lunches: pizza goldfish, apples and sunbutter and jelly sandwiches with the crusts cut off. Normally they go crazy for lunches like these, but on this day they barely ate anything. On Saturday, our whole family took a day trip to Sacramento so I packed everyone an EasyLunchboxes bento to save some time and money. 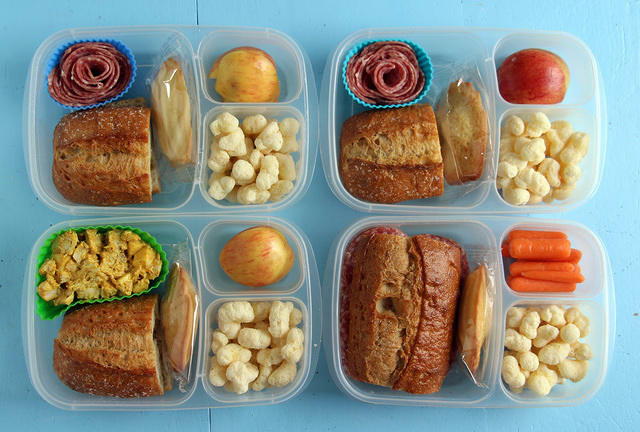 The boys’ bentos are on top and they had identical lunches again. It was touch and go there for a few minutes because Augie had asked for a PB&J sandwich, but he changed his mind at the last minute and had the same salami, baguette, madeleine, apples and Pirate’s Booty as his brother. My lunch is in the lower left. I had curried chicken salad in place of the salami, but the rest was the same as the boys’ lunches. Zach’s lunch was the biggest departure. He had the salami on the baguette and swapped carrots for the apple. We are headed into our last week of summer vacation this week! The boys won’t be in camp so I won’t have lunches to share next Monday, but be sure to check back later this week because I’ll have fun back to school giveaways every day!